What is it really like to work on Wall Street? What does the work of a successful investor really look like? We’re all about to find out. Peeptrade lets anyone glimpse into the portfolios of top traders and follow their real-time trading activity. Forget the Hollywood portraits and the news headlines that obscure the truth about what trading actually looks like – this is the real deal: actual trading, visible to those willing to pay a fee and learn how the most skilled traders operate. The best in the business – those willing to serve as gurus – link their brokerage accounts through Peeptrade and share their verified trades and portfolios. People who want to enter the world of trading, or desire to up their game, can browse this “marketplace” of portfolios and find the traders they wish to emulate, and then see how selected traders use their own money. A behind-the-scene peek (or “peep”) allows the uninitiated to better understand how to invest from seasoned pros. Peeping lets those who already trade learn from their more accomplished peers and trade more successfully themselves. It’s a win all around. Peeptrade also gives expert traders the opportunity to make more money by sharing their activity. (Traders can set their own price for letting others view their portfolios.) This is a near effortless way to grow your reputation and make additional money. Another perk is that this trading network gives traders a chance to see how they stack up against their peers. Give that ego the boost (or the kick in the pants) that it needs by comparing trading success. Yes, you can be both a guru and a peeper. The closed-door club model might serve a few individuals well, but transparency is healthy for the rest of the folk eager to trade earnestly. Newcomers see traders in action, which helps them to trade and to build trust in both the stock market and traders. Traders figure out how to trade smarter, and the best traders earn more just for doing what they already do. Everyone makes more money. Did you catch that? By participating in this social trading network, everyone can make more money? Doesn’t matter where you fit into this picture, everyone is interested in trading for this reason. So, grab the peep you need into the portfolios of top traders at Peeptrade. 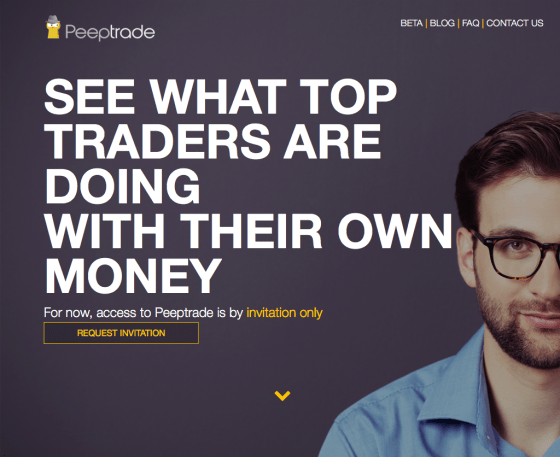 Currently, Peeptrade is in Beta and available by invitation only. Request access at peeptrade.com.